Lawmakers of the Ondo State House of Assembly have raised the alarm over "concluded plans" by the impeached Speaker, Honourable Bamidele Oloyelogun, to pass the reordered budget forwarded to the Assembly by Rotimi Akeredolu, Governor of Ondo State. 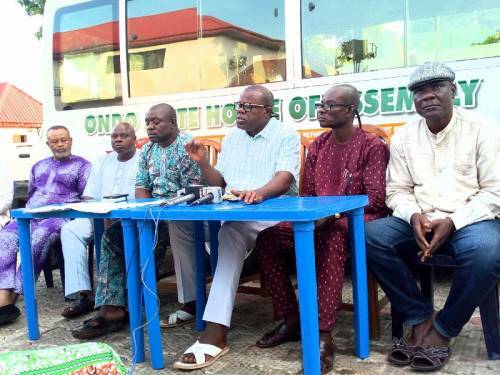 Impeached Ondo Assembly Speaker Bamidele Oloyelogun, Deputy Speaker Iroju Ogundeju with other lawmakers at a press conference in Akure, recently. in a statement issued on Thursday, and obtained by SaharaReporters, Honourable Gbenga Araoyinbo, the embattled Majority Leader of the Assembly, alleged that the reordered budget was designed to cover up some "shady dealings" of the Akeredolu and his government. The 18 members of the House of Assembly that constituted the group that impeached the Speaker, and his Deputy, Honourable Iroju Ogundeji on Friday said the passage of the reordered budget will be "unconstitutional". Fatai Olotu, Chairman of the Committee on Information of the Ondo State House of Assembly, had said the two main principals of the Assembly were removed due to their "gross incompetence". However, in a statement issued on Thursday, and obtained by SaharaReporters, Honourable Gbenga Araoyinbo, the embattled Majority Leader of the Assembly, alleged that the reordered budget was designed to cover up some "shady dealings" of the Akeredolu and his government. Araoyinbo alleged that the reordered budget is also one of the reasons the two principal officers — Oloyelogun and Ogundeji — were impeached. "It has come to our attention that the impeached Speaker of the Ondo State House of Assembly will be passing what is unconstitutionally known as a reordered budget today. We wish to state that the request for the passage of this Bill is one of the major reasons why we chose to remove and suspend the former leadership of the House on Friday, 9th November, 2018," hey said. "Rt Hon Oleyeloogun had informed us that the Governor was desirous of passing the bill into law as quickly as possible under a procedure unknown to our Standing Rules, indeed, unknown to any known law of our state or Nigeria. "By this Bill, the government seeks to cover the many shady and unappropriated approvals and spendings which are in excess of what is authorized by the budget. In the instant case, there are so many cases of moving funds from one head of expenditure to fund another head to the detriment of the expectations of our dear people of Ondo State, and there are so many cases of unjustified spendings particularly under some ministries that are under the purview of persons who are dear to the heart of the Governor. "There are many curious and inexplicable expenditures, particularly under the Government House and Protocols, while important heads of expenditure specifically designed to ameliorate one hardship or the other for our people would have their allotted funds moved into heads that are only important to Mr Governor and his hangers- on." He added that the appropriation bill calls for deep scrutiny, particularly when it was not subjected to known rules of the parliament, including the constitutional provisions as regards financial bills. According to Araoyinbo, in many instances, the governor had attempted to "bribe" the lawmakers to ensure all bills forwarded to the House quickly passed into law. The statement continued: "Oleyeloogun, acting in cohorts with the Governor and some other House leaders, insisted that we could not ask for the Year's Budget Performance and could definitely not hold a Public Hearing even to enquire from affected ministries why they chose to either overspend or the Budget or Finance Commissioners why they condoned so much illegality by allowing virements ab initio. "We were informed that the Governor would rather simply give us some hush money, while they would employ what they called 'Oku Oru" system by which they would just generate some papers to appear as if the bill had gone through a normal process. We refused and demanded that the right thing must be done. "We have been made to know that the Governor has compelled the Staff of the House of Assembly, in spite of the present danger, to sit with the impeached speaker and his fellow companions (who do not form a quorum) on the highway to infamy and pass this illegal contraption of a bill into law! "We want the general public to know that a bill of such importance was moved from the first to the second readings and committed to the Committee in one single sitting on Monday and is ready to be passed into law only three days later! How thorough could they have been?" He asked investors partnering with the Akeredolu-led government to apply caution. "We wish to state that as unacceptable as this is, it is still a tad better than the earlier proposed 'Oku Oru' system developed and perfected by the leadership of Oleyeloogun whereby bills are passed, resolutions are given clandestinely for the use of Mr Governor. Please note that our law provides that financial bills shall be passed by only two-third majority of members of the House. Any financial bill that does not enjoy this consent must of necessity be null and void. "Let the whole world know and indeed every investor who brings their money into this cesspool being manned and supervised by the Governor of Ondo State, Governor Oluwarotimi Akeredolu know that they do so at their own risk," the statement read.